I've always been fascinated by the sublime of celestial objects, the enormity of outer space and the thrill at the thought of space travel. Science fiction and real life space exploration inspires the clothing designs I create for Vivid Element. These photos feature NASA images and are from a photo shoot that was my prize for winning 1st place in the 2017 Modified Style Portland fundraiser fashion show competition in the Professional category. Thanks to Modified Style for offering me the opportunity to make one of my artistic visions a reality! The images are the result of a thrilling collaboration between photographer Heather Sikorski and myself, and our fabulous team: model and producer Robin Vada (co-founder of Aventuress Films,) stylist Kasey Curtain, and studio assistance from photographer Charles Purvis. Modified Style hosts a fashion show every year that is focused on sustainable fashion. They offer participating designers a bag of fabric sourced from vintage pieces, end of rolls and dead stock, and designers create their looks using only that material. The exciting runway show features incredible inclusivity, a wide variety of designers from amateurs to entire collections by professionals as well as an auction of the pieces and information about alternatives to fast fashion. Participating in the event was a fun experience, and I was incredibly surprised and delighted to win in my category. This is an all volunteer run event and all of the proceeds go to an arts organization. Last year they were donated to Caldera Arts. I just signed up to participate in the 2018 event. Mark your calendars: the show will be June 28, 2018. It was a dream come true to create my own space inspired images. 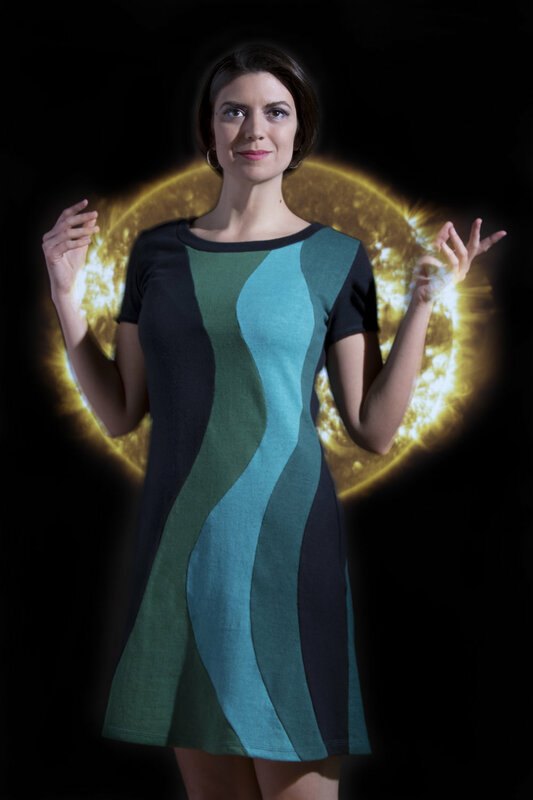 I often think of my dresses as what I would want to wear if I were traveling through space and time on a star ship. The styles of the late 1960's and the past's designs of the future are constant inspiration to me. I love the idea of designing my image of the future, today. Did you know that NASA images are available for all to enjoy and use? NASA has a huge collection of incredible images on their website. I can't get enough! This shoot involved borrowing a projector, help from a master photographer and a lot of experimentation. It has opened the doors of creativity for future shoots, and I am excited to see what comes next. Join me in exploring the universe, however near or far that may be!